Just yesterday, Versus Versace confirmed their collaboration with M.I.A., and, if you're a person who is physically incapable of anticipating something for over 24 hours, you're in luck! Photographs of collection are here; every piece is very busy and possibly eye-searing (as was prophecized a day ago). For the most part, it looks exactly like what would happen if the XXXO video manifested into the form of a gorgon statue and whispered to Donatella, "There is no such thing as too much pattern." 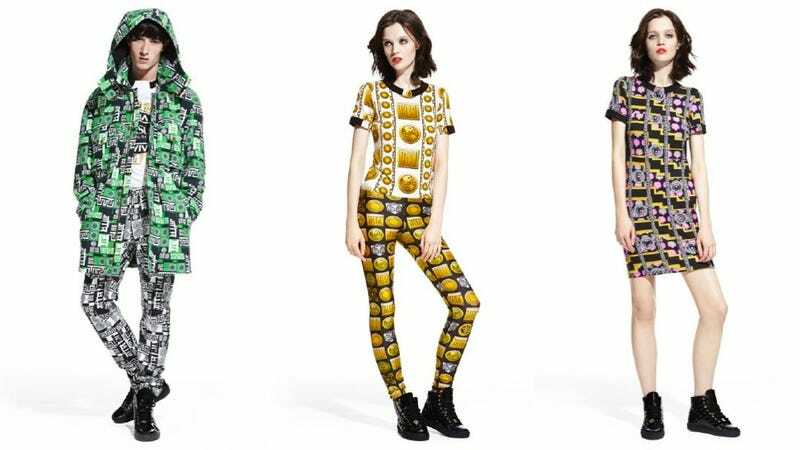 As the pair stated yesterday, the collaboration is inspired by some kind of meta inversion of the concept of "knockoff" — it's meant to be a copy of Versace knockoffs peddled on the street, so that in the future "those that copy must copy the copies," as M.I.A. put it, mind-bogglingly. Riffing on classic sportswear, the collection remixes Versace trademarks, combining golden medallions with Sanskrit-inspired lettering and glowing lotus flowers. Loud, outspoken and ready for action, it’s everyday armour, bristling with urban attitude. The collection will go on sale October 16; in the meantime, you can check out some wobbly gifs of M.I.A. & friends looking bold and beautiful on the Versace website.